Russia might have a presence in Ukraine, but that doesn't mean military personnel are in the country, a Russian official said Friday, reported Russian news agency TASS. The Kremlin has repeatedly denied any involvement in the conflict between pro-Russia separatists and the Ukrainian government, despite opposing claims from Western and Ukrainian leaders. The Kremlin stressed that the presence of citizens in Ukraine is much different than the presence of military, while countering Western arguments that suggest Russia is backing the separatist forces. "There [in Ukraine] may be citizens of all the countries: both Ukraine and Russia, and may be citizens of European countries," Dmitry Peskov, Russian presidential spokesman, told reporters, according to TASS. "But there are no Russian Armed Forces there, about what our colleagues in Ukraine and our colleagues in Europe and Washington have been speaking all the time." Peskov also said that a recent report -- in which Ukrainian President Petro Poroshenko claimed the country detained 12 militias, including a Russian citizen, during fighting Friday near Donetsk -- needed to be confirmed, according to TASS. While clashes have persisted in Ukraine since a Feb. 15 ceasefire, recent reports suggested fighting in the town of Marinka has been especially intense. The fighting has claimed more than 6,400 lives. 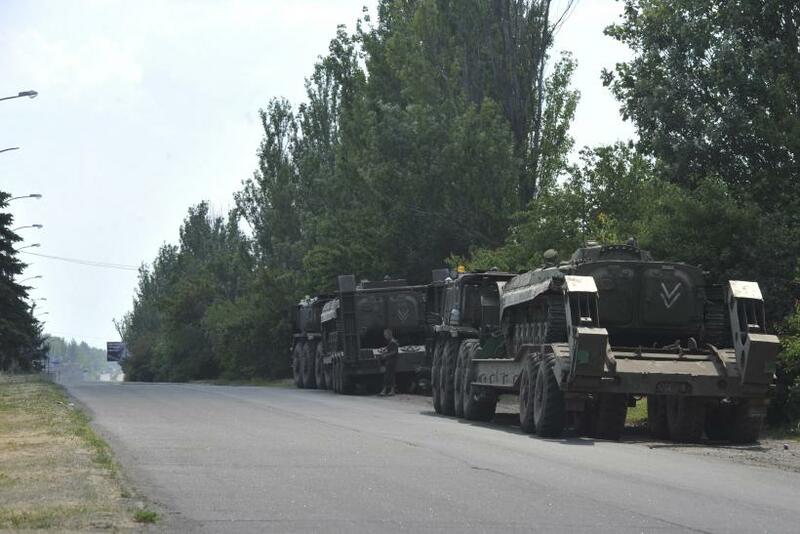 Poroshenko warned that Russia could be planning an invasion into Ukraine's eastern border region. "Ukraine's military should be ready for a new offensive by the enemy, as well as as full-scale invasion along the entire border with the Russian Federation," Poroshenko told Parliament Thursday. "We must be really prepared for this." He also claimed that Russia had 9,000 troops in the region. Russia has denied that two men -- identified as Alexander Alexandrov and Yevgeniy Yerofeev -- captured by Ukraine forces were members of the Russian military. The two men are reportedly hospitalized and under supervision in Kiev.